More early morning runs, parakeets and The Muppets! So last Monday was a rest day (following on from the very hot Ware 10k), and then yoga was moved to Tuesday evening so we could watch the football. It was my last yoga session before the summer (they are term time classes only)- we did a bit inside and then lots outside which I love so much. I got up super early on Wednesday (5am) for a run before work, as I knew I wouldn’t have time after. I think I did 4 miles at a fairly leisurely pace, but I felt better after. (Also, because of our hot water problems I needed to put the immersion on for a while before having a shower, so I may as well go on a run while it heats up). I was a huge flock of parakeets flying overhead- I’ve seen them in St Albans before but not here. Since then I’ve seen them a few times when I’ve been walking around. Thursday we had yoga at work, and then I stopped for a quick run on my way home- I was going to do a 2 mile loop. When I got back to my car, it had been blocked in on both sides- with about 2cm on either side. Loads of people were walking past and one guy commented on how close the other cars were, so I asked him if he would help me try and get out. He stood at the back but even after a few forwards and backwards I wasn’t really getting anywhere. It turned out there was an event at the secondary school around the corner, so I wrote down both number plates and ran up there, found a member of staff and very apologetically asked if they would make an announcement (I think it was some sort of open evening so I did feel bad speaking to the staff when they were so busy). Thankfully they made an announcement and one guy started going back to the car. He was the one parked behind me, although he had the cheek to tell me that I wasn’t very well parked and that’s why he had to park so closely behind me! When I had parked there had been a van in front, so I had parked with space between me and the van, but the van had obviously driven off it was a huge 4×4 in front. I did explain this, and he then “let me off”. The cheek! I was fuming- but I couldn’t really argue as at least he had come to move his car unlike the other person. Anyway, all that faff added loads of time on (probably about half an hour) so I got home pretty late. After a shower and dinner we had a bit of a walk (saw more parakeets). Then on Friday I had to head home super quick because we were going to see The Muppets! I quickly packed as we were staying overnight in London, walked to the station and got the train to Moorgate before the tube to near our hotel. After checking in and dropping our bags off, we headed to the DLR (don’t ask me what we did because I get very confused on there- why are all the lines the same colour???) and picked up a sandwich in Canary Wharf. We ate them outside the O2 and then headed in to join the enormous queue. Everyone was having to go through metal detectors and bag searches, but for some reason they were so slow and the queue would not move an inch for 5 mins. There were no announcements for the people in the queue though, and I have no idea why it took so long (for FOTC they did bag searches and had metal detectors for people to walk through, and the queue moved the whole time). The show started at 8 and in the end we got inside at about ten past, just as they announced the show would be starting so we had to run up the stairs, find the door, run down the stairs as we were on the floor near the front, and then apologetically squeeze past people as the show was about to begin. Anyway, the show was brilliant, with puppets on stage (a bit like Avenue Q, you can see the puppeteers all dressed in black but you just tend to watch the muppet- some of them had 3 puppeteers to one puppet), bits happening on the screen, and of course the very special guests including David Tennant, Charles Dance and Kylie (she was singing Manamanah and then Rainbow Connection). We were sat quite close to where the special guests were, so could see when they were about to be needed on stage again. One of the films was a Netflix parody with things like The Walking Bread (with the Swedish Chef) and my favourite- Frogglebox! I am sure you can guess what that was! 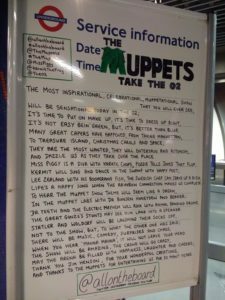 It reminded me of many happy times at Disney watching the Muppet show there, and it was just such a fun evening. I didn’t dilly dally and decided to get a t-shirt. As we were staying in London we didn’t have too long a journey, so we got a mint tea from the Starbucks just outside, and then headed back to the hotel. I shall save my Saturday morning adventure for another post! Do you like The Muppets? 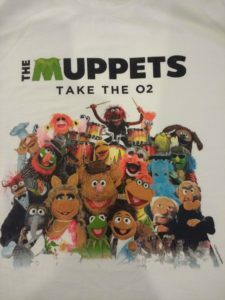 I think their shows are funny, but the two most recent films (particularly Muppets Most Wanted) are such funny films with brilliant songs. Have you seen parakeets where you live? A while ago I would only see them in Richmond park or parks in London, whereas they seem to be really spreading now. 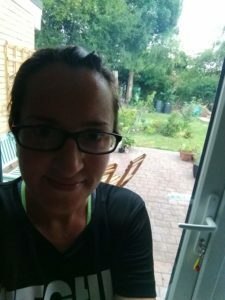 Author Maria RunsPosted on July 17, 2018 Categories General ramblings, Running, Stuff I love! Oh I do love The Muppets! How cool that you were able to go and see the show. 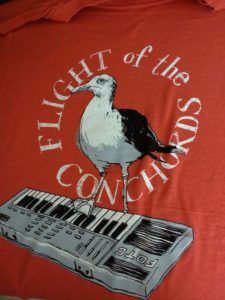 Did you see them in Florida? I have done in the past, but not this year. 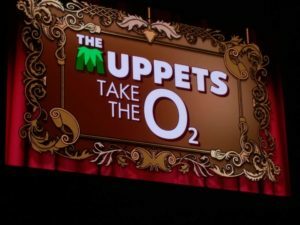 I like the Muppets but I’ve never seen a production like this – in fact, I didn’t even know they did it! Sounds very fun. That guy – how rude!! I’d have been annoyed too. What utter cheek of him. It was their first time in the UK- I think they mainly stay at the big place in LA.